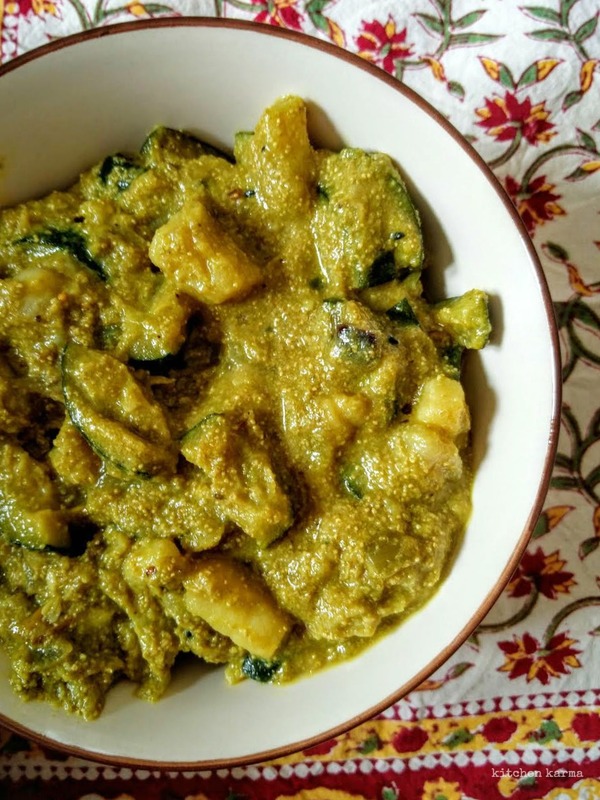 The fifth day of the #NationalVegetarianWeek and I am surprised with myself that I am still going strong with this challenge of sharing one Bengali vegetarian dish a day for this whole week. 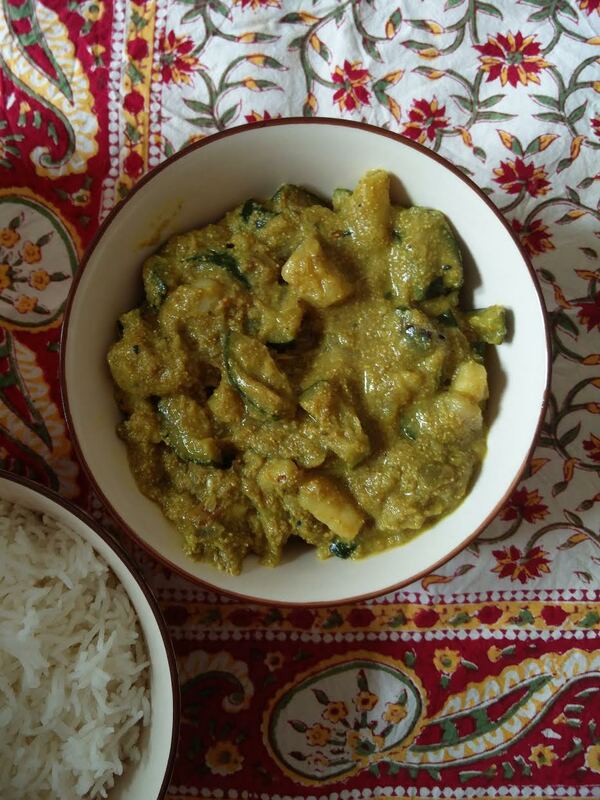 Today I have for you an all time favourite Bengali dish called posto. Posto is a paste made with white poppy seeds. I know what you are thinking poppy seeds = opium and all kinds of oriental opulence. But I assure you that these seeds are pretty ineffectual on their own, at the most after a meal of rice and posto you will feel super drowsy. People living in the western part of Bengal are inordinately fond of this paste. We eat it in various ways starting from posto bata which is nothing but just the paste with a bit of chopped onions, green chillies, salt and a glug of mustard oil to posto or bora making fritters with the paste to cooking a whole range of veggies and even seafood & fresh water fishes using this humble paste. Remember I said inordinate*. Birbhum and Bankura are some of the districts of Bengal where people can't imagine sitting down to lunch without some form of posto on the menu. Since both my parents hail from Birbhum I guess posto kind of runs deep in my blood. I can happily survive on posto bhaat/rice like forever. *Not satisfied with just eating it, people often name their kids posto. The famously embarrassing Bengali tradition of bestowing strange nicknames on kids. Not to be left out, my family also gave me about a hundred nicknames, but thankfully none of them that embarrassing. But let me not deviate from posto. Like I mentioned there are various ways we cook with the poppy seed paste. Today I have for you potato and zucchini cooked in poppy seed paste. I know what you must be thinking, but zucchini is not an Indian veggie by any stretch, isn't it? Well you are right and I totally agree. The traditional combination is potato and ridge gourd. Of course to get hold of ridge gourd I have to go to my Indian grocery store which is a good 30 minutes drive from our home. Our frequency of consuming posto is way higher than our trips to the store, so I had to experiment. After trying the various local vegetables in poppy seed paste, husband and me, we arrived at the very profound realisation that zucchini when cooked resembles the ridge gourd the closest in taste and texture and the zucchini takes to poppy seed like duck to water. So this combination is cooked and consumed in our home in alarming frequency and in vast quantities. Give this combination a try, you won't be disappointed. **You can make this dry and serve with dal or keep it semi liquid or as we say in Bangla john jhol. I make both depending on whether I have the time and energy to make the dal. The dal served with this is kolai er dal which is the Bengali urad dal. You could serve this with mushurir dal or even mong dal. P.S. No pressures at all, but when a Bengali serves posto with any other dal than kolai er dal I feel really disappointed like someone has personally let me down and kinda judge that fellow Bengali a little lot. In my book aloo posto can only be consumed with kolai er dal if you are serving any dal with this.